While you can grill year round (at least if you’re willing to put up with a little weather), summer is the prime time for back yard BBQs. 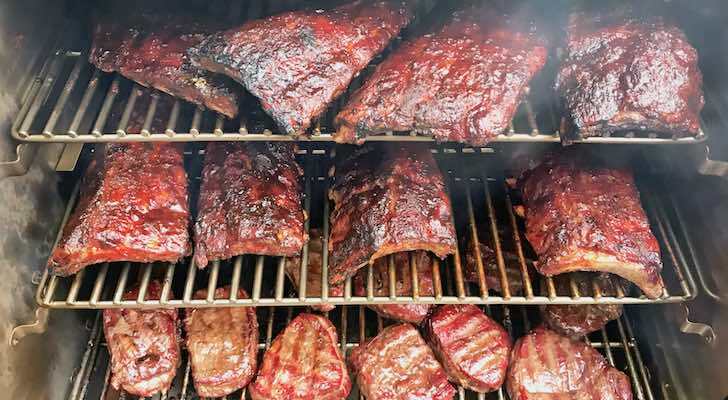 Starting with Memorial Day, then the first day of summer, the 4th of July holiday and finally Labor Day, the summer is one BBQ opportunity after another. While choosing the right meat — and vegetables, if you’re so inclined — is obviously important, the key to a successful BBQ is the grill. The choices can be a bit overwhelming, especially when you see row after row of shiny grills lined up on the floor of the big box store, prices ranging from under $50 to well into the thousands of dollars, a huge array of form factors and multiple fuel types to choose from. Tech has even made its way into the game! To make sure you have the best summer BBQ season ever, we’ve put together a list of 10 of the best grills, including a handful of portables you can throw in the car to take tailgating, to the beach or camping. You can even buy many of these online, or at Amazon (NASDAQ:AMZN) if you don’t feel like wrestling with a big, heavy box in the parking lot. There may be no grill that’s more iconic than the Weber Original Kettle Charcoal Grill, with a design that dates back to the 1950s. Since those early days, Weber has broadened the lineup, with grill sizes ranging from 18-inches to 26-inches and even adding color options to the traditional black. 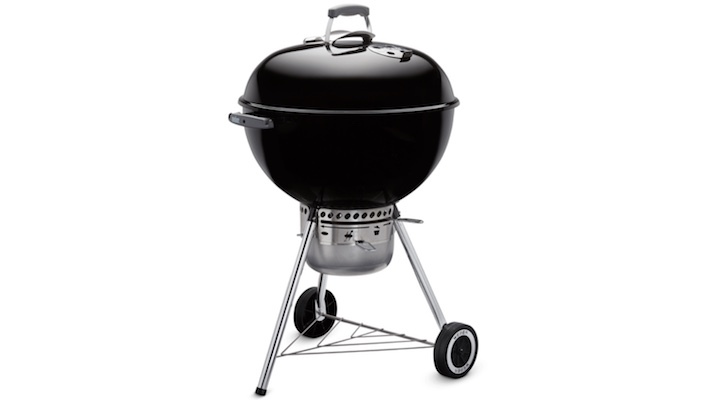 But no matter the size or color, Weber Kettle grills are among the most popular for home BBQs. They are affordable (starting at $89), the charcoal-burning kettle is easy to assemble and operate, and it can be used to cook everything from hamburgers and hot dogs to steaks. Like many people, my first grill was a Weber Kettle, Much as I loved it, I wanted something just a little more refined. Enter the Weber Performer. The company got the idea to take that classic Kettle as the starting point, then add a bunch of extras that up the user experience. The Performer is built around a 22-inch Weber Kettle, but builds it into a cart that adds a large, flat work surface that makes preparing your food much more convenient. It also gives you somewhere to set your drink. There’s an integrated charcoal storage bin, so refueling is more convenient. And getting the grill going is far easier because the Performer includes a propane-powered ignition that gets the coals glowing quickly. I have three grills in my back yard (plus a pair of portables), and the Weber Performer has remained the go-to for a decade. There may be a bit of a trade war brewing with Canada, but that doesn’t mean you should ignore one of the best grills to come out of the land of snow, maple syrup, butter tarts and bagged milk: Napoleon. I have a Napoleon gas grill holding down the propane end of things in my setup (nothing beats gas when it comes to fast), but it’s a relatively small model. One of the ultimate grills from this company if you have the need for some serious outdoor cooking is the Napoleon Prestige PRO 825 RSBI. This is a massive grill, with 1430 square inches of cooking surface and 123,000 BTUs spread across two independent grills and a side burner. It also includes illuminated controls and interior, an integrated wood chip smoker tray, infrared rotisserie burner and even a built-in ice bucket. 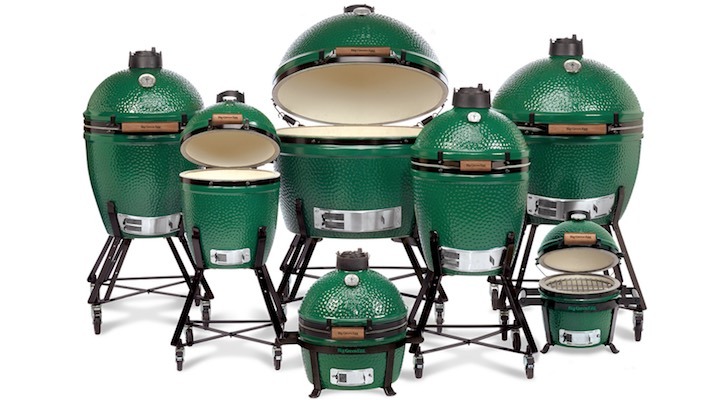 There has been a surge in popularity of ceramic, kamado style charcoal grills, but it’s pretty tough to beat the original: the Big Green Egg. The ceramic cooker offers many advantages, including temperature regulation (making it an ideal choice for long, low temperature barbecue and even baking), as well as superior fuel efficiency. You also don’t have to worry about rust, so while a Big Green Egg is a considerable investment, it’s going to last for many seasons of back yard BBQs. Weber may be best known for its charcoal kettle grills, but the company also makes a line of premium gas grills. 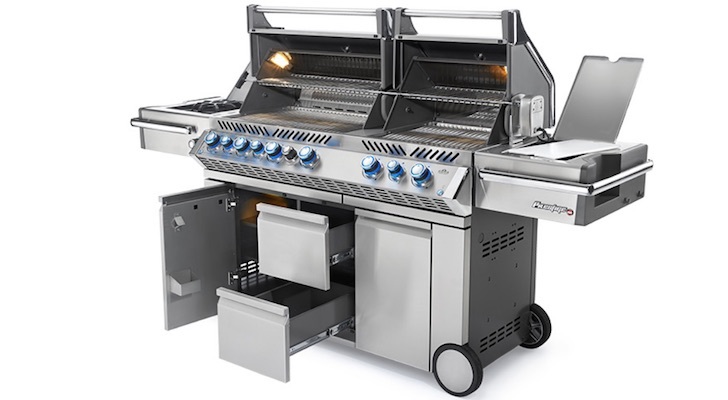 The high end of the spectrum is already covered by that Napoleon PRO 825 RSBI, but Weber makes one of the best mid-range gas grills in the business: the Spirit II E-310. 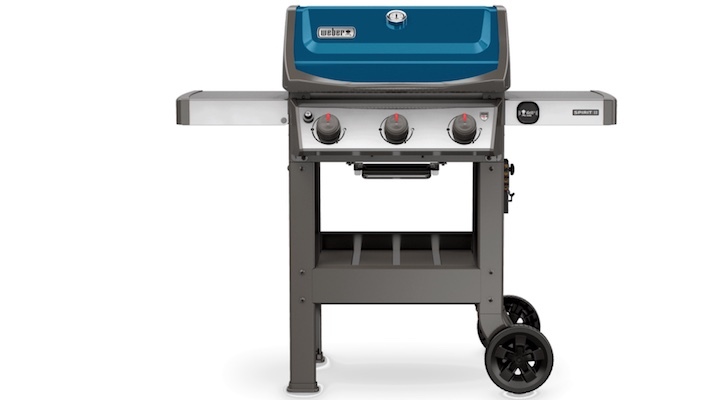 This three burner grill has 30,000 BTUs of power, 424 square inches of cooking space (plus a warming rack), a durable design, compact form factor that makes it patio-friendly and an affordable $599 price. And it consistently takes top honors in testing, including top pick for The Wirecutter. When it comes to backyard grilling, charcoal and gas grills tend to be the most popular. But many BBQ fans swear by wood, especially when you want to cook real barbecue with low temperatures and plenty of wood smoke. 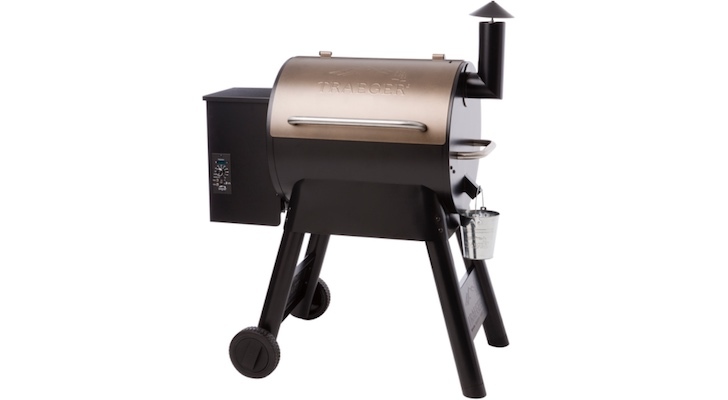 Traeger’s Pro Series 22 pellet grill makes wood-fired grilling easy. A hopper holds 18 pounds of hardwood pellets (available options include Hickory, Apple and Mesquite). An electric auger feeds pellets to a burner and its thermostat keeps the temperature steady. While the Traeger Pro Series 22 pellet grill is ideal for all-day, low temperature cooking with plenty of wood smoke, it can also be cranked up for traditional grilling and it has the room for 24 burgers at a time. 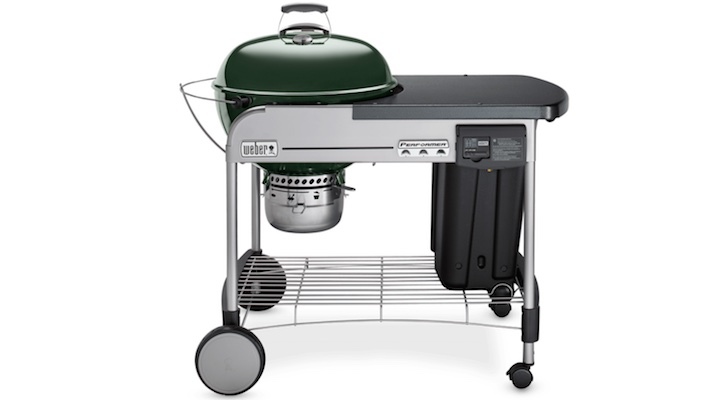 The first of our portable grills is the Napoleon TravelQ 2225. If you don’t like strangers wandering over to see what you’re up to, maybe skip this one, because the TravelQ definitely attracts attention. 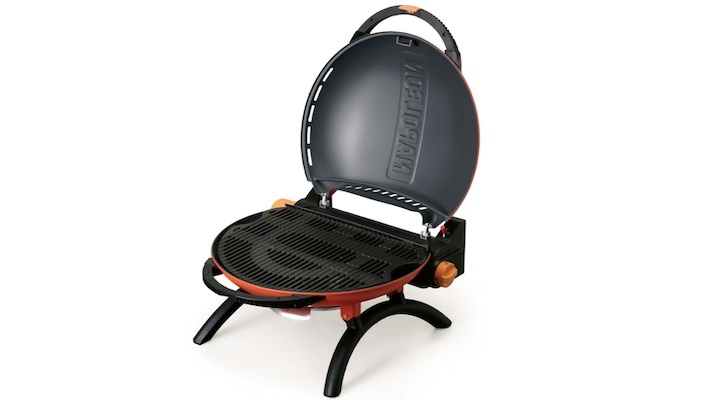 From the bright orange paint job to the flying saucer form factor, this portable gas grill stands out. It folds up for carrying with an integrated handle (a carry bag and cart are optional). Once at your destination, unfold the legs, connect a portable propane cylinder and fire it up with the Piezo ignitor. The TravelQ has 225 square inches of cooking surface, a circular 10,500 BTU burner and a removable grease tray. You can cook up to 16 burgers on its porcelainized cast iron grill. Of course Weber has versions of its Kettle charcoal grill designed specifically for the portable grilling crowd. The Smokey Joe has the instantly recognizable look of the classic Weber Kettle, but in a miniaturized form factor that makes it portable. 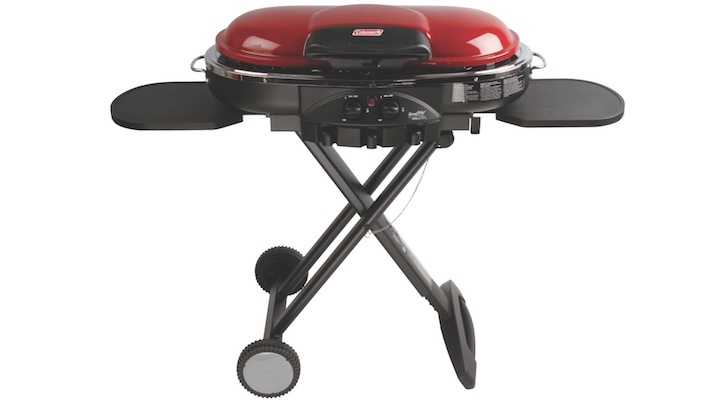 The Smokey Joe’s grill is 14-inches, enough for 147 square inches of cooking surface. 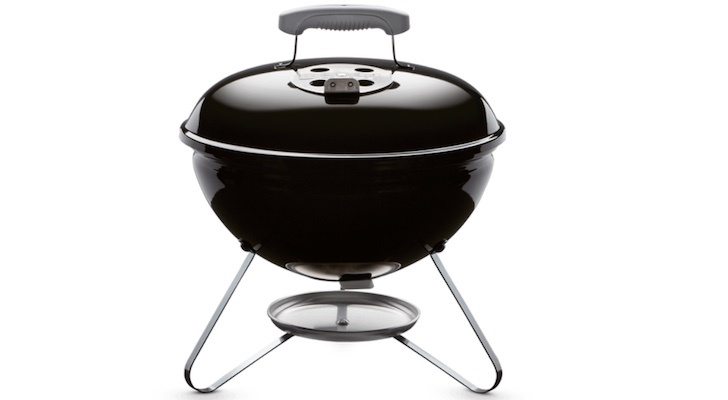 And at just $34.99, the Smokey Joe is about as affordable as a grill gets. Coleman may be best known for camping gear, but the company makes some great portable grills as well. It’s not their newest model, but my favorite remains the Coleman Roadtrip LXE — it’s still the grill I bring on all my camping trips. This $199 portable propane grill comes mounted to a cart that folds to offer a handle and wheels that make the whole thing easily transportable. Set it up and you get 295 square inches of cooking surface with 20,000 BTUs on tap and pushbutton start for the dual burners. Dual sliding tables give you a work surface. And one of the best things about this particular grill is the range of widely available accessories, including a griddle top that makes it as capable of cooking up breakfast as steaks or burgers. Finally, a grill that I’ve been evaluating as part of a long-term test: the Traeger Timberline 850. As far as I’m concerned, this is my idea of the ultimate grill. Like the Pro Series 22, this is a wood pellet grill. But it is bigger — capable of cooking eight whole chickens at once — with a 24 pound hopper for those hardwood pellets. It’s built like a tank (it weighs 213 pounds), with a commercial-grade stainless steel interior and airtight lid gasket (all the better to keep that smoke inside). 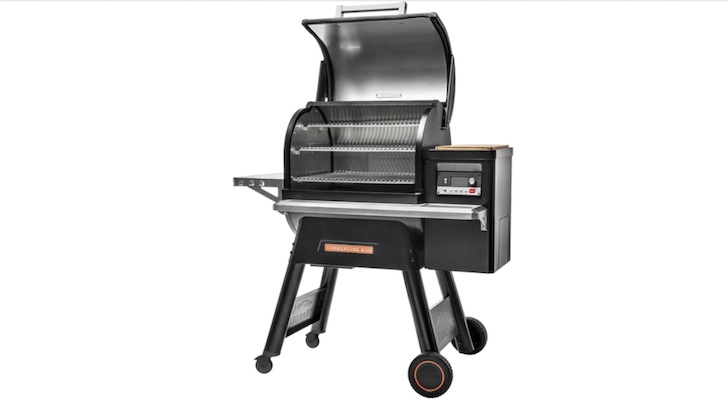 But what takes the Timberline 850 pellet grill to the next level is its built in Wi-Fi connectivity (Traeger calls it WiFIRE). This isn’t tech for tech’s sake. It lets you monitor the grill remotely using your smartphone. You can also adjust the temperature remotely, and even engage the “super smoke” mode. When you’re cooking barbecue “low and slow” all day, this connectivity gives the ability to actually leave the house and run errands — like picking up some more beverages — without worrying about who’s watching the grill. I can’t say which is the “best” grill for you, but any of these will do the job nicely. Article printed from InvestorPlace Media, https://investorplace.com/2018/07/the-10-best-grills-for-your-summer-bbq/.